With the rainy season, Lietchuor refugee camp, which shelters some 40,000 people from South Sudan, has become a lake dotted with islands. As a result, Ethiopia’s Administration for Refugee and Returnee Affairs (ARRA) and the UNHCR have taken the decision to close the camp and they must find an appropriate site to relocate the refugees. Heavy rains and flooding have also caused serious damage in Pagak and Pamdong transit camps, also in Ethiopia’s Gambella region, but Lietchuor camp is the worst affected. The camp is located on flat, bare ground, with “black cotton soil” on which the floodwater pools and stagnates. The newly constructed tukuls (mud huts) for the refugees are completely flooded. The road built on a strip of elevated land is the only remaining inhabitable area, and some of the refugees have set up their tents along its course. Others have left the camp, with hundreds sheltering in nearby villages with the host community or in churches. During the most recent rainstorm on 24 August, shelters were blown down. Médecins Sans Frontières/Doctors Without Borders' (MSF)’s compound has been also flooded. Strong winds blew down the plastic sheeting covering the roof of the staff tent, forcing the team to relocate. And inside the camp, the latrines, which were hastily built, have overflowed, with some collapsing completely. MSF medical facilities however resisted. 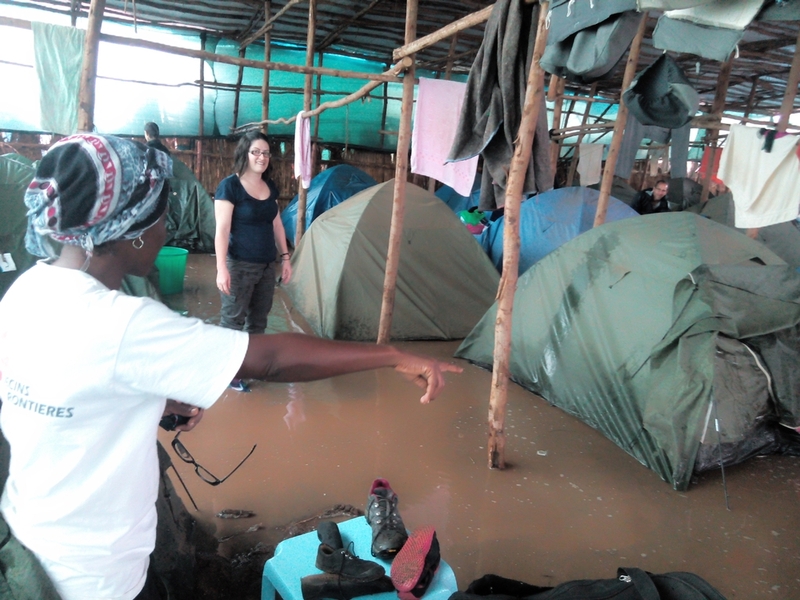 Despite now being on an island surrounded by floodwaters, the MSF health centre as well as the MSF’s hospital which has a total of 107 beds and includes a maternity ward and intensive therapeutic feeding centre, all set up in separate tents, continue to operate. MSF teams have raised the medical tents to 40 cm above the ground and built a drainage system around them, with the result that the beds and the patients in them remain dry. Logistics are a vital part of MSF's work, but in cases such as this can represent a considerable cost. Finding an appropriate alternative site for the refugees is now crucial. The site should be like Kule and Tierkidi not prone to flooding and should have trees that can provide shade during the dry season’s scorching temperatures as well as firewood to enable refugees to cook their food rations. Finally, the site must not present a security risk to the refugee population. But the Nip Nip, Dima and Pugnido potential sites identified by the authorities do not meet these criteria. MSF is ready to provide medical care for the refugees once they are relocated to an appropriate new site. Meanwhile, MSF teams will continue to provide care in Lietchuor camp, where people still have medical needs. Most patients seen by MSF staff in Lietchuor camp are suffering from malaria and respiratory infections, but hepatitis E and jaundice are also a problem. Between late-May and late-August, 354 cases of hepatitis E and jaundice were detected. The current hygiene conditions will have a sever e impact on the population’s health. However no cases of cholera have been recorded. On 23 August, MSF teams completed a cholera vaccination campaign in the camp, immunising more than 39,000 people against the disease. Also affected by the most recent storm is MSF’s 120-bed hospital in Itang, near the camps of Tierkidi and Kule. A dyke reinforced by the MSF team to protect the hospital collapsed, and the clinic, which saw patients from both the refugee and host communities, is no longer functional. Thirty-five inpatients have been transferred to other tents, while a number of other patients have been referred to health facilities run by other partners. Access to healthcare is essential for the refugees in the Gambella region, and solutions must be found to ensure that medical care is available in the camps for all those who need it. MSF is also present in Kule and Tierkidi camps where the organisation is providing health care as well as water and sanitation services.